Inside The Box is the only book that details the method called systematic inventive thinking. Most of the books you deal with today on this topic are more about the why or how you execute innovation. 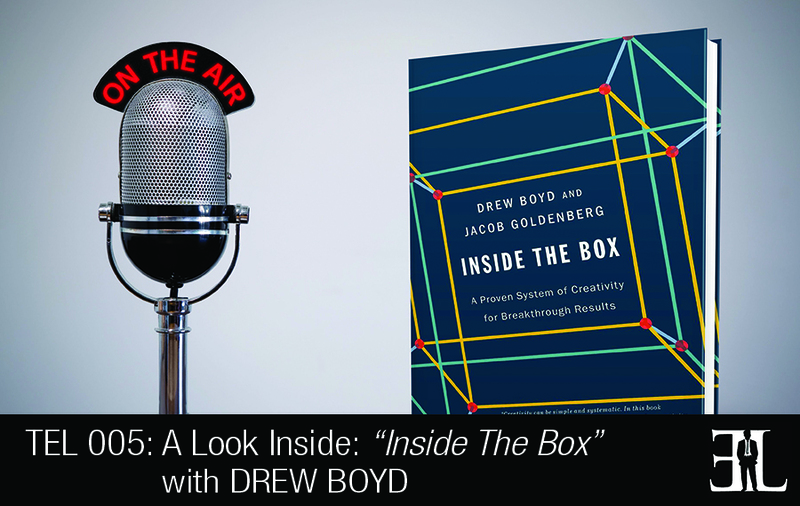 Drew Boyd and Jacob Goldenberg wrote the book with the intent to give people a way to understand creativity, the method, and the cognitive tools of how you use your brain in a different way to produce novel ideas you weren’t likely to produce without the method. Our book is the only book that details the method called systematic inventive thinking. Most of the books you deal with today on this topic are more about the why or how you execute innovation. Very few, if any, really deal with the how and that’s what companies want to know. We wrote the book with the intent to give people a way to understand creativity, understand the method, the cognitive tools of how you use your brain in a different way to produce novel ideas you weren’t likely to produce without the method. The idea that I would take out of the book is that innovation is a skill. Innovation is not a gift, it’s a skill that can be learned and learned in a systematic way by harnessing the power of patterns and how those patterns could regulate your thinking, channel your ideation and make you create concepts that you weren’t likely to have created on your own. This book starts with an introduction to the method and so it’s essential that the readers read the introduction. In chapter one we dive into one of the most important principles called the closed world principle. The closed world is this imaginary boundary around where your product or services is being used. The closed world principle says that the farther away you have to go to import solutions to your problem, the less creative it’s going to be. In other words the most creative solutions are right under your nose. Then the next five chapters detail each of the five techniques. Chapter two starts off with what’s called the subtraction technique. We finish the chapter with a specific list of steps you follow to use to subtraction technique and common pitfalls. We want people to avoid the routine mistakes that sometimes happen when using the technique. Chapter three is the division technique. This chapter tells some stories about the prevalence of this particular pattern and the many products and services that the division technique can produce. Chapter four is about the multiplication technique. Many innovated products have taken a component, created a copy of it but then changed the component into some counter-intuitive, non-obvious way. The fifth chapter is called new tricks for old dogs; it’s about the task unification technique. Many innovated products have taken a component of the product and then assigned it an additional job. This technique produces some amazing innovations. Chapter six is about the fifth and final technique. The title of the chapter is clever correlations, the attribute dependency technique. The majority of innovated products have taken an attribute of the product and created a dependency between them. In chapter seven we talk about what are called contradictions. A contradiction is when you have two opposing ideas that can’t exist at the same time. In this chapter we show people how just the opposite is true, that contradictions are a source of creative thinking and we do this by showing people how to use the five techniques to solve contradictions. Our final chapter is called final thoughts and here we are really try to give people a sense that creativity is the way you make the world a better place. We want people to feel the sense of empowerment, that they can learn innovation. Creativity is a skill; it’s not a gift or something you are born with. You can use these five techniques to boost your creative output no matter where you are in the creativity scale. The epilog tells the very nice story about my experience teaching children, as little as third grade, this method and the surprising result of how these children were so capable of using this method to produce innovated ideas. If a third grader can do it than people from all walks of life should be able to innovate with this message as well. I’m a professor at the University of Cincinnati but I’m really a corporate guy. I’ve been in large organizations for over 30 years and 17 of those years were at the global healthcare company, Johnson & Johnson which is where I learned this method that the book is about. It’s really inspired from two perspectives; one is my time at Johnson & Johnson. We were very desperate to find an innovation method to create new medical products and we spent millions of dollars looking for a method. Just by chance I happen to find out about this method called systematic inventive thinking and we realized immediately that it was special, that it worked very well and I continued to practice it over the last 12 years. A few years later I met my co-author Dr. Jacob Goldenberg, it’s his research that this method is based on. He and I became friend, started teaching and working together when he asked if I wanted to write a book together. Without even thinking about it I said yes. What do you think about Dr. Goldenberg and Drew Boyds’ innovation method?